At MSS we supply high quality Cast Polyurethane products and Polyethylene Lining materials for use in various industrial sectors such as the Mining & Quarrying Industry, Chemical Industry, Electrical Engineering, Orthopedics and the Food & Packaging Industry. 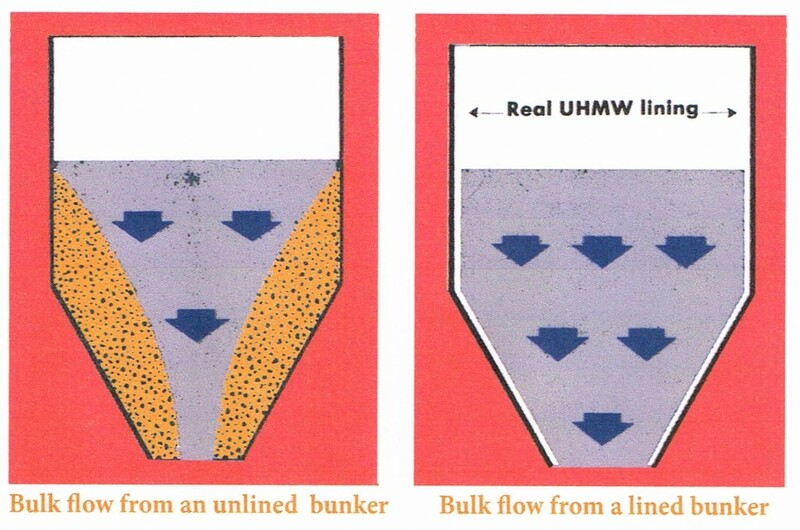 Our Lining materials greatly enhance the flow of bulk materials in bunkers and chutes, transport and storage bins. Our polyurethane Castings vary in use, from Belt Scraper Blades and rollers used for conveyors in the Mining & Quarrying Industries to Customized Mouldings used for a wide variety of engineering applications. Polyurethane: Polyurethane is a unique material that offers the elasticity of rubber combined with the toughness and durability of metal. 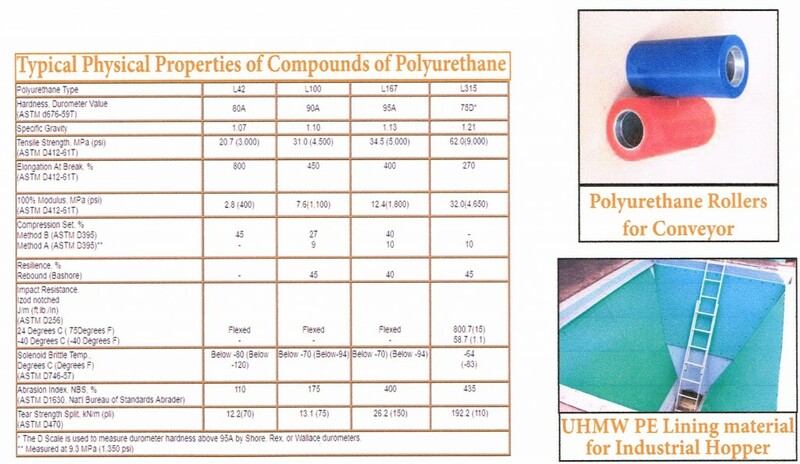 Because urethane is available in very broad hardness range (eraser-soft to bowling-ball hard), it can replace rubber, plastic or metal while providing improved abrasion resistance and physical properties. Urethanes have better abrasion and tear resistance than rubbers, while offering higher load bearing capacity. Urethanes have replaced metals in sleeve bearings, wear plates, sprockets, rollers and various other parts, with benefits such as weight reduction, noise abatement and improved wear resistance. Ultra High Molecular Weight Polyethylene (UHMW PE): Light weight, high in tensile strength and as simple to machine as wood, UHMW PE is the ideal material for many wear parts in machinery and also as a superb lining in materials handling systems and storage containers. UHMW PE is self-lubricating, shatter resistant, long wearing, abrasion and corrosion resistant, all of which are the material characteristics needed to withstand the harsh conditions in which the products we supply are put through on a daily basis. We can supply a huge range of custom Polyurethane Castings exactly to the customers specifications including the required shore hardness. We cater for one-off jobs and large orders. The flow of bulk materials for bunkers, storage bins, silos and other containers along with the transportation of these materials through chutes, troughs, hoppers and similar devices is often disrupted by caking, bridging or freezing. Elimination of those problems can only be achieved by expensive and time consuming methods. These problems can be solved by using Ultra High Molecular Weight Polyethylene A1000 linings. 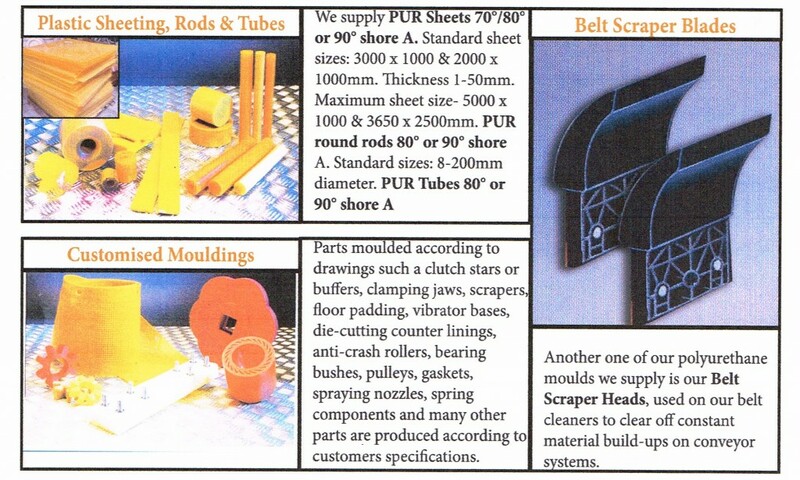 We supply this product in sheet form and other shapes for storage and material handling equipment. PE 1000 is supplied in standard sheet sizes: 2000mm x 1000mm. Other sizes are also available. The 6mm to 15mm sheets are the most widely used and recommended range of thickness that we have available.